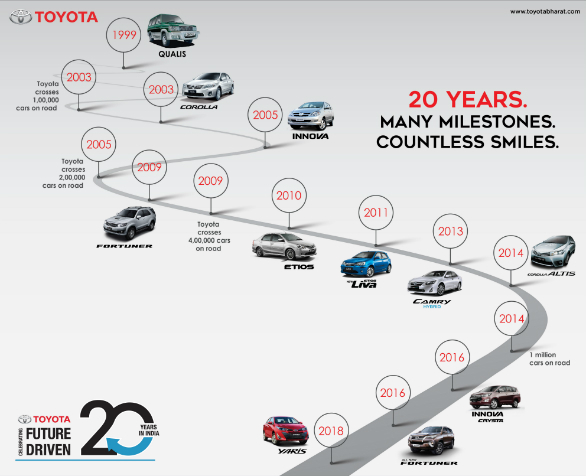 Toyota Kirloskar Motor, the Japanese carmaker's Indian arm has completed 20 years of operations. The company set up its first factory here in 1999 and launched its first car, the Qualis, in 2000. The company has since gone on to cover much of the Indian car market. 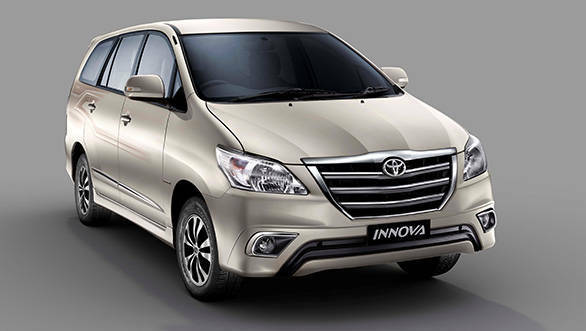 Its most successful models have been the Innova and the Fortuner, which debuted in 2005 and 2009 respectively. Also successful have been the Camry (2002 debut) and the Corolla (2003). Its other cars have been the Etios sedan and hatch (2010) and the Yaris sedan(2018). The company also claims to have taken a strong initiative to provide safer cars to Indian customers. Toyota is the first auto manufacturer to have standardised airbags across all grades in all models in India in 2015. Later, in 2016, it made ABS and EBD standard with the launch of the Platinum Etios and Liva. With the Yaris, Toyota Kirloskar also became the first in the segment to offer seven airbags, driver and passenger, side airbags, curtain shield airbags and knee airbag as standard. The company has also been quite active when it comes to giving back to the environment. In FY 2018-19, Toyota sourced 87 per cent of the electricity needed for its operations in the Bidadi facility from renewable sources. Masakazu Yoshimura, managing director of Toyota Kirloskar Motor said, "We would like to thank our customers, our vendors, our people and the Government for the relentless support and trust in the company over all these years. The inspiration from all our partners has been instrumental in our growth in India. Toyota globally believes in creating a smart mobility driven society with an integrated approach connecting People, Vehicles and the Society. At Toyota, we are constantly challenging ourselves to create new ways to move and connect our customers. India is a very important market for us, we have been continuously striving to bring in newer innovations and technology to cater to the discerning taste of customers. All through this long journey, our products have stood the test of time being appreciated for the value it offers to customers. Toyota's renowned reputation of Quality Durability and Reliability (QDR) has led to our steady growth in the Indian automotive market. We are proud to declare that over 1.5 million Indians are part of the ever growing Toyota family. We also strive towards developing a more sustainable future and being pioneers in the Hybrid Technology is our first step towards this movement. Through initiatives focussed on education, community development and the environment, we aim to create a company that works in harmony with nature and society."